Today I thought we'd visit Caspari in Charlottesville, VA again. If you did not see my first post click here to visit our first part of the tour. 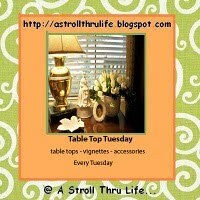 The first post about the store was focused mainly on table settings since I was linking to Tablescape Thursday that day. which are abundant throughout the store. Faux florals in cache pots. Love blue and white with the punch of lemon. Caspari's outstanding stationary line of products. I enjoyed seeing their use of vertical space. Here with the ladder and wood shelves . . .
next to painted bench and table. I adore this cube table with faux boxwood. Lots of tables in front of tables, I need to remember that trick! They had Mary Lake Thompson towels!! Even the window displays were tabletop designs. I'm joining Table Top Tuesday today. I love picking up design ideas from store and boutique displays. Tables displayed in front or other tables, stacked on top of one another, etc. There are so many things to see and enjoy. Thanks for sharing. So fun to visit shops this way. Now if I could only visit in person! Thanks for sharing. Well, I could go wild in that store. LOVE the MLT towels all the displays are awesome.